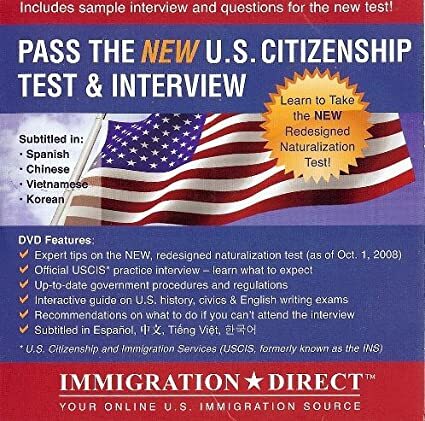 Your road to passing the U.S. citizenship test [DVD] by ECM MultiMedia, Inc. ; filmed and edited by Kyle Day. This easy-to-use video is a fun and memorable way to learn the exact questions you need to answer to become a U.S. citizen. The content has been provided by the United States Citizenship and Immigration Service. Designed to help you pass the United States citizenship exam. Subtitled in Spanish, Chinese, Vietnamese, and Korean. "Naturalization is the process by which U.S. citizenship is granted to a foreign citizen or national after he or she fulfills the requirements established by Congress in the Immigration and Nationality Act (INA)." You may download the pocket study guide Preparing for the Naturalization Test [.pdf] here. "This presentation provides a general overview of the naturalization process including where to find immigration information and the general requirements for obtaining U.S. citizenship." "The USCIS Naturalization Interview and Test is a 16-minute video that provides an overview of the naturalization process and testing requirements." Scroll down to second video choice. This office serves the following counties in North Carolina: Alexander, Alleghany, Anson, Ashe, Avery, Buncombe, Burke, Cabarrus, Caldwell, Catawba, Cherokee, Clay, Cleveland, Davidson, Davie, Forsyth, Gaston, Graham, Guilford, Haywood, Henderson, Iredell, Jackson, Lincoln, Macon, Madison, McDowell, Mecklenburg, Mitchell, Montgomery, Polk, Randolph, Richmond, Rockingham, Rowan, Rutherford, Stanly, Stokes, Surry, Transylvania, Union, Watauga, Wilkes, Yadkin, and Yancey. If you need legal advice on immigration matters, make sure the person helping you is authorized to give legal advice. To check the status of a pending application, petition, or request, go to Case Status Online. You will need a receipt number. You can also call USCIS at 1-800-375-5283 (TDD for deaf and hard of hearing: 1-800-767-1833) or make an appointment at a local field office at infopass.uscis.gov. Search "US Citzenship" in the library Catalog. On the results page, click the title of any book to see the full display and availability. Also available from the U.S. Citizenship and Immigration Services website in PDF format. Updated for the new 2014 N-400 application. Professor Allan Wernick is a widely-noted authority and advocate on U.S. Citizenship and Immigration Law and is renowned for his ability to clearly explain the issues surrounding this highly complex field. Find an English or citizenship preparation class near your zipcode. Study guide; Chinese language material. Study guide. French language material. Study guide; Spanish language material. Cuidado con los asesores de inmigracion deshonestos . . .
National Immigration Legal Service directory. Search by zipcode (28054) or by Detention Facility.